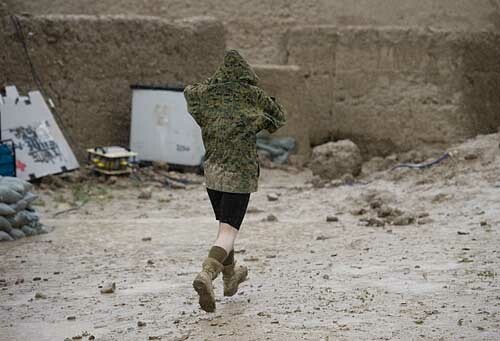 A Marine (name withheld) runs across the muddy courtyard at Patrol Base Sheheban. Marines from Weapon’s Company, 1st Battalion, 8th Marines operate out of PB Sheheban in Kajaki, Helmand on April 20, 2012. Sheheban is a joint position with Afghan National Civil Order Police (ANCOP), providing security near one of a few river crossings at Kajaki.